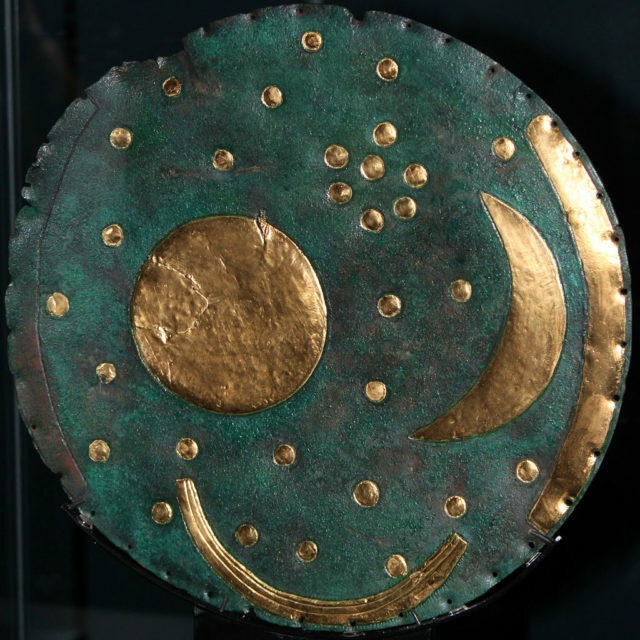 The Nebra sky disk is a bronze disk of around 30 cm diameter and a weight of 2.2 kg, with a blue-green patina and inlaid with gold symbols. These are interpreted generally as a sun or full moon, a lunar crescent, and stars (including a cluster interpreted as the Pleiades). Two golden arcs along the sides, marking the angle between the solstices, were added later. A final addition was another arc at the bottom surrounded with multiple strokes (of uncertain meaning, variously interpreted as a Solar Barge with numerous oars, as the Milky Way, or as a rainbow). The disk is attributed to a site near Nebra, Saxony-Anhalt, in Germany, and associatively dated to c. 1600 BC. It has been associated with the Bronze Age Unetice culture.The disk is unlike any known artistic style from the period, and was initially suspected of being a forgery, but is now widely accepted as authentic. The disk, two bronze swords, two hatchets, a chisel, and fragments of spiral bracelets were discovered in 1999 by Henry Westphal and Mario Renner while they were treasure-hunting with a metal detector. 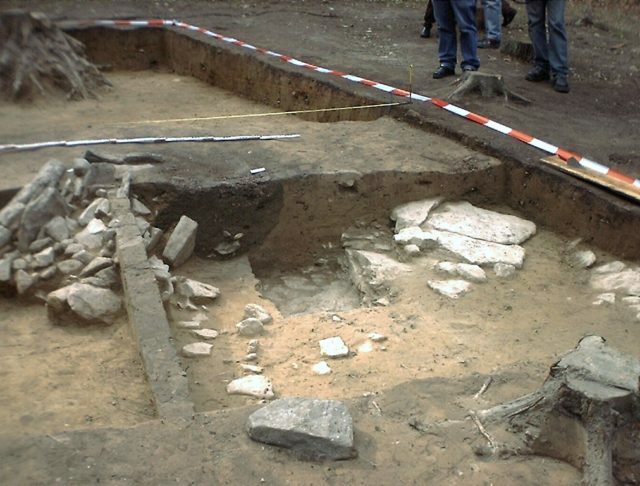 Archaeological artifacts are the property of the state in Saxony-Anhalt. The hunters were operating without a license and knew their activity constituted looting and was illegal. They damaged the disk with their spade and destroyed parts of the site. The next day, Westphal and Renner sold the entire hoard for 31,000 DM to a dealer in Cologne. The hoard changed hands within Germany over the next two years, being sold for up to a million DM. By 2001 knowledge of its existence became public. In February 2002 the state archaeologist Harald Meller acquired the disk in a police-led sting operation in Basel from a couple who had put it on the black market for 700,000 DM.The original finders were eventually traced. In a plea bargain, they led police and archaeologists to the discovery site. Archaeologists opened a dig at the site and uncovered evidence that supports the looters’ claims. There are traces of bronze artifacts in the ground, and the soil at the site matches soil samples found clinging to the artifacts. The disk and its accompanying finds are now held at the State Museum of Prehistory in Halle. The two looters received sentences of four months and ten months, respectively, from a Naumburg court in September 2003. They appealed, but the appeals court actually raised their sentences to six and twelve months, respectively. The discovery site is a prehistoric enclosure encircling the top of a 252 metres (827 ft) elevation in the Ziegelroda Forest, known as Mittelberg(“central hill”), some 60 km west of Leipzig. The surrounding area is known to have been settled in the Neolithic era, and Ziegelroda Forest contains around 1,000 barrows. The enclosure is oriented in such a way that the sun seems to set every solstice behind the Brocken, the highest peak of the Harz mountains, some 80 km to the north-west. The treasure-hunters claimed the artifacts were discovered within a pit inside the bank-and-ditch enclosure. 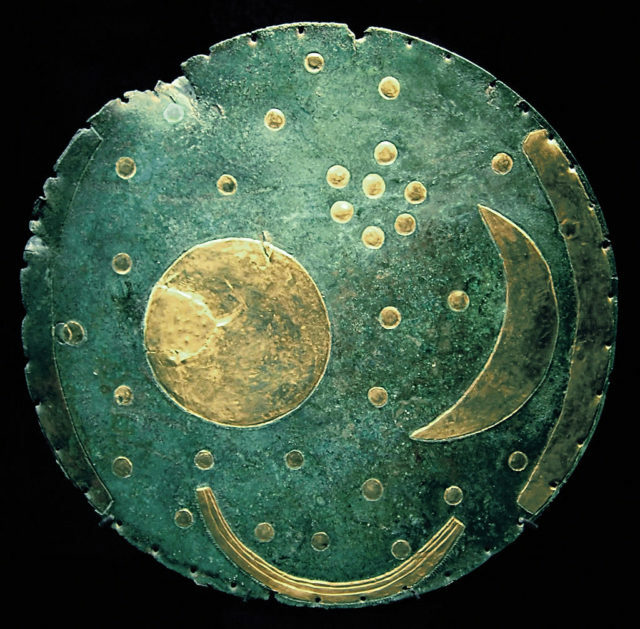 The precise dating of the Nebra sky disk depended upon the dating of a number of Bronze Age weapons, which were offered for sale with the disk and said to be from the same site. These axes and swords can be typologically dated to the mid 2nd millennium BC. Radiocarbon dating of a birchbark particle found on one of the swords to between 1600 and 1560 BC confirmed this estimate. This corresponds to the date of burial, at which time the disk had likely been in existence for several generations. According to an initial analysis of trace elements by x-ray fluorescence by E. Pernicka, then at the University of Freiberg, the copper originated at Bischofshofen in Austria, while the gold was thought to be from the Carpathian Mountains. A more recent analysis found that the gold used in the first phase was from the river Carnon in Cornwall, United Kingdom.The tin content of the bronze was also from Cornwall.